The petty sessions were an equivalent of the modern magistrates' court, where all minor disputes and infringements of the law were dealt with in front of a justice of the peace or magistrate. The detail included in these records makes them an invaluable resource for those with Irish roots. We have 22 million of these records, and believe it or not, there's a good chance your ancestors make an appearance. In the absence of so many Irish records a resource with such detail can be a great help when filling in the gaps, not to mention adding a lot of color to any family history story. Ancestors can appear as witness, defendant, complainant and even as justice - with full details of cases and their eventual result, complete with sentence if any. The image of the record contains sometimes quite considerable description and quite often reassures us that our forebears were no different from us! 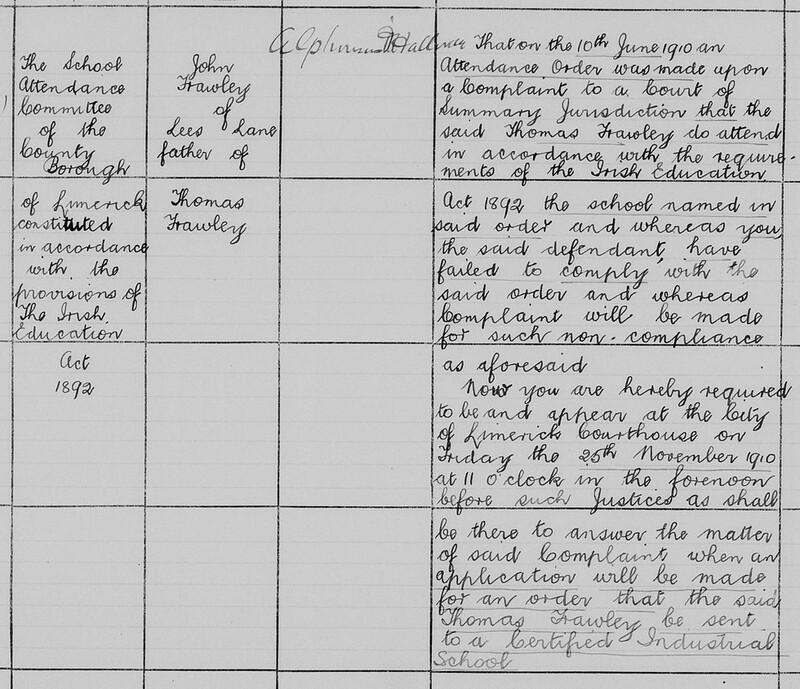 In the example shown here, a man named John Frawley was summoned before the court by the school attendance committee of the county borough of Limerick due to his son Thomas refusing to attend school. The school board seem to have got to the end of their tether with young Thomas and then attempted to have him sent to an industrial school, a sort of boarding school for orphans, delinquents and ne'er do well children where they could be forced to learn. These problems still occur today as you might see in any newspaper, but from this record not only do we have an address of our ancestor and a genealogical relationship but dates and locations, plus the makings of quite a story! For those of us fortunate (or perhaps unfortunate) enough to find relatives in these records, we can only say that we hope they got off relatively lightly!